Thanks so much to Alexandra Anthony for having me on her blog today. I wanted to share with you and hope you enjoy the excerpt. Waking Up Dead is finally live at Amazon as well as Smashwords and Barnes & Noble. I’m thrilled! Now for the interview. Enjoy! 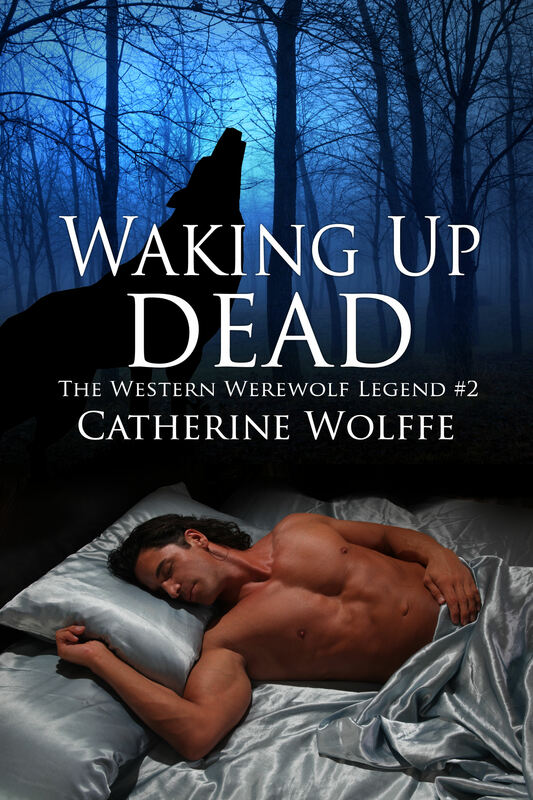 I’d like to give a warm welcome to Catherine Wolffe and thank her for taking the time to stop by my blog to introduce her new book in The Western Werewolf Legend Series. We sat down and she was gracious enough to give us a sneak peek into the book and answer a few questions. I’d love to, Alexandra. Waking up Dead is the second book in the Western Werewolf Legend. The setting is 1864 and the civil war is dragging on. Sonja Brooks, a Pennsylvania widow has fallen in love with Tyler Loflin, a Rebel soldier. She embraces her wolf while he does his best to protect her from the vampires searching for her. With a sharp-tongued witch and a werewolf god as mentors, Sonja and Ty set out to right injustices and save the innocent. Hopefully the weather is getting better in your part of the world and Monday is a good day with sunshine and warmth. Spring is here in the deep south. The flowers are blooming, the pollen is floating and the birds are singing. Sorry about the pollen, those are the facts, though. We are expecting warm weather today, perfect for mowing the grass which is already growing like crazy. What I’d like to share with you today is another excerpt from The Lady in the Mist. With the release of Waking Up Dead in less than two weeks, I wanted to give you another peek into the world of Sonja and Tyler. Becoming a werewolf is hard enough. Compound that with falling in love and you have pretty good idea of the delima Sonja faces. Ty has his own set of problems with his military responsibilities and changes happening that he doesn’t understand. Sonja woke with a start. Her gasp came out short. The sheet clung to her clammy body but she didn’t acknowledge either. Blinking back tears, she wiped at her cheeks. It was the dream— that had brought her to the brink of despair. Ty slept beside her, a man well sated. A tender smile trembled across her mouth as she leaned over. The dark strains of hair covering his eyes made her wish for a different time, a different place for this to happen to them. She brushed Ty’s hair from his eyes. The chiseled planes of his face stood out in stark relief against the white of the pillow. How perfect he was. With her arms wrapped about herself, Sonja pondered this man the fates had sent her. The pleasure of watching him sleep took some of the pain of the dream from her. She didn’t want to think about him leaving, though he surely must go. The pain would be too much to bear, she mused. She wanted him like her next breath. What would she do? Surely, things wouldn’t turn out as bad as she’d envisioned. With the old witch’s potion, she would get him to sleep through the full moon. Hopefully, with some luck they’d both make it through her becoming a werewolf. I’ll be sharing a new steamy free sample of The Lady in the Mist soon on Amazon and Smashwords. Be on the lookout for that announcement in the coming days. Thanks for stopping by. Posted on April 8, 2013 Author catherinewolffe53Categories My Books, New Releases, samples, The Western Werewolf Legend series, writingTags Amazon, Catherine Wolffe, Facebook, literature, Paranormal Romance, Romance, The Lady in the Mist, The Western Werewolf Legend by Catherine Wolffe, Vampires and werewolves, Waking up Dead, Western Werewolf2 Comments on Good Morning! The Paperback copy for Tempted…. The Paperback copy for Tempted…..Congratulations to Alexandra Anthony on the release of her latest novel in paperback, Tempted: The Dark Hart Chronicles. Posted on April 6, 2013 Author catherinewolffe53Categories New Releases, writingTags Amazon, Catherine Wolffe, Facebook, Paranormal Romance, Romance, vampire erotica, WritersLeave a comment on The Paperback copy for Tempted…. Spring is always a good time of the year to slow down and reflect on the simple joys around us. We may have to look closely and dig through some pollen to get to those joys, yet they are there if we will only open our eyes to their magnificence. The sky turns a warmer blue and the birds sing their happy songs. The earth begins to emerge in Mother Nature’s magnificent glory. We start to hope for better days and the future looks brighter simply because the sun shines a bit more. The snow melts to expose the treasures of fledgling plants surging toward new life. Showers fill the creeks and feed the vegetation in promise of a greener earth. I chose this time of the year to share my book with readers. The Lady in the Mist is the the first offering in The Western Werewolf Legend series. With Waking up Dead’s ebook release at the end of the month, I wanted to give the readers a chance to hold The Lady in their hands. If they like, an autographed copy is available from me. Contact me at catherinewolffe@gmail.com or you can pm me at https://www.facebook.com/AwardWinningAuthorCatherineWolffe for the price and details. Nothing means more to me than hearing from those who read my work and enjoy the story. Please drop me a line and share your thoughts. I’d love to hear from you. I considered the release of Waking up Dead for April because of the parallel of a new start to go along with the story line of the book. Ty and Sonja are in search of such a new beginning and their journey starts with the closing of a chapter. The world they knew so well has become a dangerous place. They have to flee. The trip is made more dangerous with the added responsibility of protecting those they care about. Here’s an excerpt between Sonja and her sister as they leave the familiar for the unknown. I hope you enjoy reading the excerpt as much as I enjoy bringing this portion of their story to you. Sonja’s sister glanced at her before focusing straight ahead.“No, I’m not sorry. A little sad to have grown up and lived in the same place for so long. Now to be driven away by Perkins and his vultures makes me angry.” She paused and glanced at her boys asleep in her lap. “Where are we headed?” Laying a hand on the boys’ weary heads, she smiled when her children yawned openly. “South.” Sonja peered up ahead at the wagons they’d procured for the journey. The Confederate soldiers had all changed into civilian clothing thanks to Hortence and her spells. South sounded like a far-away place and the idea made Sonja nervous. Her hands wanted to shake. She gripped the reins tighter. The road, so far, had wound around bends and up hills before spilling into another valley with new growth greening more readily the further they went. “I’m sorry I got you into this mess.” The words came unbidden. Sonja didn’t give them time to linger before she smiled for her younger sister. Briann was beautiful with her long waves of coppery fire. The boys resembled their mom and Sonja secretly hoped they always would. A smattering of bright freckles dusted their noses and pert pink lips formed perfect bows in their cherub faces. Love swelled in her chest when she watched them in all their innocence. Her family – what was left of it was precious to her. She tried not to think of what she would do if anything happened to them. Briann quieted again. Sonja wanted to give her sister some comfort, some support. However, the danger they all faced remained a grave deterrent. She slapped the reins over the horse’s rump and steered the team to follow the wagon ahead of theirs. The gentle sway of the wagons proved mesmerizing. Sonja was already tired and they’d barely cleared Pennsylvania. Ty had secured several wagons to help with the refugees who couldn’t walk properly. Sonja drove one, while Smitty and Conners drove the other two. They rode side by side for a long time without saying anything. Truth sometimes had a way of crippling one’s notions of their abilities. Sonja would speak to Hortence and the Guardian about Briann’s fears. Surely, her sister was mistaken about her abilities. She was her sister whom she loved more than life itself. If she had to give up her gift to save her sister, she’d gladly do it. Just a note: I’ll be blog hopping with Carrie Ann Ryan next week and sharing a freebie with blog hoppers, as well as bookmarks and ebook giveaways. Don’t miss my posts next week!